Saturday 13th December Jim’s hoose. Whisky Tasting – Jim’s contribution to this evening’s tasting was a Glenlivet Single Malt Scotch Whisky 12 Years Old. 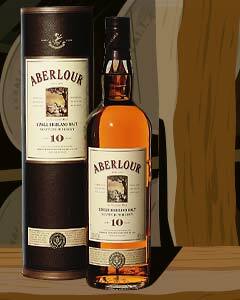 Dougies dram came in the shape of a bottle of Aberlour Single Highland Malt Scotch Whisky Aged 10 Years. Tonight we again had a guest taster and he was in the shape of Philip Giles from Donaghadee County Down N. Ireland, where he is a well known local entrepreneur. Philip is a farmer and very experienced cattleman by trade but also has many,many strings to his bow, owner of a trout lake, coal merchants business, holiday accommodation, livestock, trades in old and rare motor cycles (more as a hobby). Honey producer from his orchard hives. A livery business. An expert horseman. With all these experiences it is not surprising that his knowledge has made him a sought after man throughout the world. Philip although enjoys a good malt (just like the Whisky Boys) his main dram over by is Blackbush distilled at the Bushmills Distillery, so Jim and Dougie were hopeful we could get Philip to appreciate or native Whisky and enjoy a serious tasting session. Now lets get down to business, the tasting, first up is the Glenlivet. Glenlivet distill quite a complete range of Malts ranging from mainstay 12 year old up to 25 year olds plus special cellar editions and cask strength bottlings, please go onto their site for a full background to this grand distillery. Glenlivet’s main and ongoing goal is to oust Glenfiddich from their top spot, this I think is a challenge and a half but it is possible they have the malts and the range and the name to maybe one day be the top dram. Now lets do some tasting. Jim pulled the cork from the bottle and poured our usual measure into the three tasting glasses, as usual we had our slightly chilled water to hand and three water glasses to cleanse our palates. As usual colour was not in question we all agreed on A Pale Gold, going slightly paler with the addition of some water. Nose… Airfix model adhesive and a hint of stewed apples, but with the addition of water it became sweeter and more fragrant. Taste… Very smooth and rounded with a woody spiciness. Finish… This wee dram did not linger long but felt quite warming. Nose… Nose drying solvent with a light caramel background, but with the addition of water a leafy fragrance and a touch of vanilla. 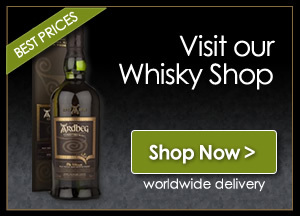 Taste… A medium body with more than a touch sherry and a fruity background. Finish… A pleasant but short lived fruitiness. Nose… Solvent but clean and round, but with the addition of water flowers and a light hint of marzipan. Taste… A definite hint of liquorice. Finish… Very clean and smooth but with a short lived finish. We all were impressed by this wee dram, we all felt it was very peasant and certainly a bottle to remain and replaced when consumed for our cabinets. For the records Jim managed to purchase this grand wee malt from Somerfield’s Supermarket in Denny for the sum of only £16.99 a very small price for a very big and well respected Speyside malt, Jim and Dougie will not be strangers to pulling the cork out of this bottle. Now we can move onto the next tasting, the Aberlour, same day, same hoose, same tasters plus the same guest taster, Philip Giles. Aberlour not quite as big a producer as the Glenlivet but substantial in its own right with many distinct malts to its name. From its bread and butter 10 Year Old through to a 31 year old reserved for the travel retail market in France, but in between we have 12 year olds, 16 year olds 18 year olds all with varying finishes and strengths to supplying many independent bottlers like Douglas Laing and Cadenhead both doing varies bottlings including one at 21 year old, but you may have to look in some of the specialist Whisky shops to try and find any of these, or indeed try the internet. Now for the best bit, the tasting, details as listed above, let the nectar flow. Again we must bore you with our agreement on colour, a definite Amber. Nose… Short bursts of spice and toffee, but mellowed with the addition of some water. Taste… Very smooth, medium to full bodied and quite complex. Finish… A dryness with pepper spiciness but remains only a little while on the palate. Nose… Spicy pears and sherry but gives of a honeyed background when the old h2o is added. Taste… Medium to full bodied, sweet leading to honey and tobacco. Finish… A fair length of spiced smoke and peat. Taste… Very smooth and soft, medium bodied. Finish… Short and smoky, honey with a sting. Once again a smashing wee dram, we could not fault it, but out of both of these tasting it was Philip who not only surprised the Whisky Boys but also himself, he could not believe that by sitting down discussing the Whisky and taking your time to nose, taste and experience a couple of great Scotch malts, he could find the amazing and different smells and tastes within a wee dram. Philips parting phrase was “when are we all going to do this again”. Philip will now look and experience Whisky in a different light and give them the proper respect that they are all due. The Whisky Boys loved this session and was surprised by Philip and the flavours he was coming up with, boy, do we enjoy a good tasting session and it is sometimes more enjoyable when someone else is there and also enjoys the great experience that is Scotch Malt Whisky. So lets look forward to the next one. Next story Edradour Whisky – What’s in your hip flask ?